This post explores flood control engineering, water management and pollution controls currently in place at London Gatwick airport. The post adds detail to the previous article on flood control in the River Mole basin and should provide a fuller understanding of flood control on the River Mole including management of water flows through Gatwick airport and any impact on downstream discharge, including pollution. The previous post on the causes and management of flooding more widely in the River Mole drainage basin can be found here. 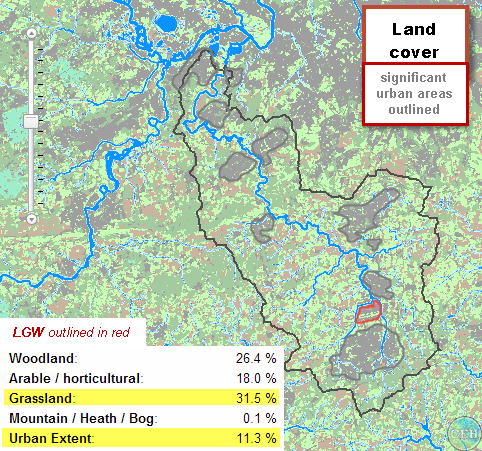 Gatwick Airport is built across the low relief, impermeable clay flood plain of the Upper River Mole drainage basin. The solid geology is mostly impermeable Lower Cretaceous Weald Clay with some sandstones overlain by recent drift deposits of river gravels and alluvium deposited by the four rivers. This mostly impermeable surface gives the Mole a naturally rapid (“flashy”) response to rainfall events as less precipitation is able to infiltrate into rocks and instead flows as surface runoff into streams and channels across the clay plain delivering water to channels rapidly and raising discharge quickly after storms, an altogether more speedy process than soil throughflow which dominates in more permeable drainage basins. Three tributaries of the River Mole drain into this basin within or near the boundaries of the airport: Crawters Brook, Mans Brook and Gatwick Stream. All of these rivers have been extensively modified, diverted and culverted during the history of the airport development and both up and downstream during the wider urbanisation of the area most particularly in Crawley, Manor Royal industrial estate and Horley. Most significantly, the Gatwick Stream was culverted underneath the South Terminal during original airport construction in 1958. More recently, the River Mole was diverted in 2000 further north and west to accommodate the North Terminal. A second runway will require further diversions and channel modifications of streams and rivers and further significant attenuation schemes to manage additional runoff from any new runway. This article outlines how Gatwick airport manages runoff and water flow to reduce the impacts of flooding and pollution not only within the airport boundary but also upstream and downstream of the airport. It should be noted that the Upper Mole basin is an increasingly urbanised catchment with over 11% of the drainage basin covered in urban development. Despite initial perceptions, Gatwick comprises only a small proportion of this total urbanised land cover in the River Mole basin, parts of which are expanding as a key growth area in the south east with the M25, M23 and London to Brighton railway providing excellent infrastructure for growing business and commercial activity and attractive locations for housing. At less than 8 sq/km, the airport itself is currently around three times smaller than the urbanised area of Crawley (30 sq/km). So Gatwick is just a part of an urbanising River Mole catchment and therefore shares responsibility for managing the river with other land users and the Environment Agency. Despite the difficult hydrological siting of the runway on a flood plain and the negative press regarding winter flooding, Gatwick airport is managing water flows responsibly and behaving as a good neighbour to the local area by investing in the Upper Mole Flood Alleviation Scheme that will endeavour to control flooding, not just benefiting the airport but also reducing flood risk for Crawley and downstream to Horley, Reigate, Dorking, Leatherhead, Fetcham and Esher and the M25. All human development within flood plains from the smallest garden patio, private driveway or house extension to the largest scale road project, shopping centre or major airport, reduces the natural capacity of landscapes to moderate the flow of water into rivers. Human development usually involves the removal of trees and vegetation and the addition of impermeable hard surfaces such as cambered roads, sloping rooves, guttering and drains that are designed to remove water as quickly as possible to avoid local flooding. Such development prevents the infiltration of water into the ground which slows the movement of storm runoff into rivers by allowing some of the precipitation to “sink in” to the soil, thereby slowing down flow reaching the river. Trees and vegetation also intercept rainfall and transpire water from the soil and these processes also slow the movement of water into channels or removes it from river basins altogether by the natural process of evapo-transpiration from vegetation. The time it takes for water to enter rivers is called “lag time”: the time between peak rainfall intensity and peak discharge. Lag time tends to be longer in naturally vegetated lowland basins and those with permeable geology. In developed river basins with extensive urban surfaces the lag time tends to be shorter. Rivers with short lag times are sometimes called “flashy” because they respond rapidly to rainfall events and flood more easily. Storm runoff reaches the river quickly across impermeable surfaces and this shortens the lag time and exacerbates flooding. All development has a tendency to speed up the transfer of runoff into rivers. Airports are large open areas, the runways alone covering 4km2, with extensive impermeable surfaces. Such wide open impermeable surfaces could therefore have significant impacts on local river discharge unless runoff was carefully managed. Like all airports in the UK, London Gatwick works closely with the Environment Agency to ensure runoff and pollution are carefully controlled. The shortening of lag times through the rapid removal of rainfall from urban areas can cause flood problems downstream as water ingresses into channels more quickly and this is why Gatwick “attenuate” runway runoff by the addition of holding or balancing ponds. Each airport is unique in how the site creates challenges for water managers. Gatwick was built in a low flood plain which clearly presents unique flood and pollution control challenges particularly now due to climate change and increased rainfall intensity. Nevertheless, all airports present one challenge or another with regard to their site. Heathrow is located on permeable gravels and these present challenges for controlling pollution entering the water table. Other major UK airports located further away from fluvial flood risk are presented with the challenge of shedding excess surface water from heavy rainfall efficiently into balancing ponds and water courses with sufficient capacity to remove pluvial flood water. So Gatwick is by no means unusual in having its own unique challenges presented by a flat low lying site. “Balancing ponds” are the main engineering device for “attenuating” runoff from airports. 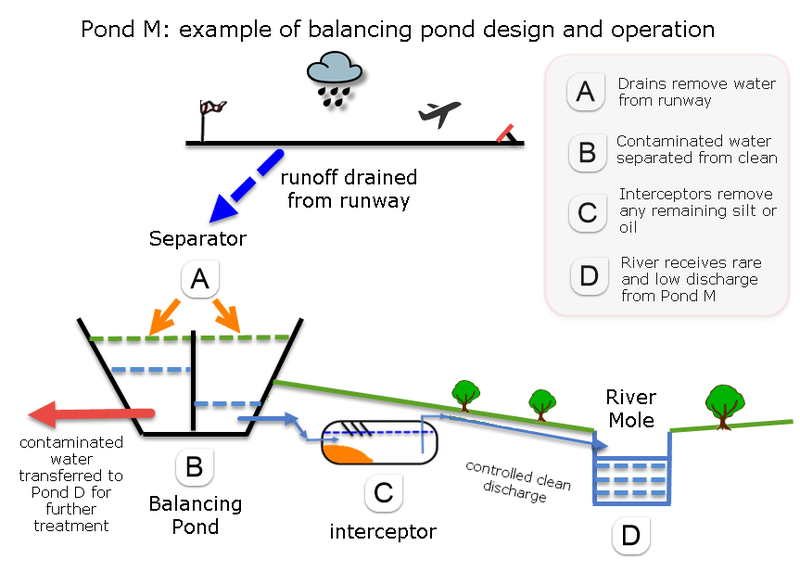 Balancing ponds are designed to delay or “attenuate” runoff from runways by holding back discharge from reaching the river directly from the runways and hard surfaces inside the airport boundary. Balancing ponds are large, sophisticated engineering structures and are one of the most extensive spatial land uses for many airports, including Gatwick. A glance out the window on take-off or landing from LGW will show keen-eyed observers numerous balancing ponds and channels in amongst trees, tracks and open spaces around the runway perimeter. These ponds are linked into a complex gravity-fed system designed to transfer runoff and separate clean from contaminated water and treat it and store it, before eventually returning the water to local rivers in a controlled manner or recycling it for other purposes within the airport itself. All eight of the Gatwick balancing ponds have been designed to control the rate of runoff so that flows are equivalent to the runoff from a grassy or “greenfield” surface. In short, from the point of view of precipitation, Gatwick airport acts hydrologically like a vegetated grassy surface because rain falling over the runways flows into balancing ponds that regulate runoff reaching the River Mole at a discharge equivalent to water flowing off a greenfield. For every square metre of additional concrete built within the airport boundaries the airport is obliged to construct additional attenuation to meet this “greenfield” attenuation requirement. This will also be the case for any second runway. For example, new multi-storey car parks have subterranean attenuation ponds built underneath. It is worth noting that the obligation to strictly control and continuously monitor runoff is not the case for all development outside the airport boundaries, for example additional private driveways, housing and roads. 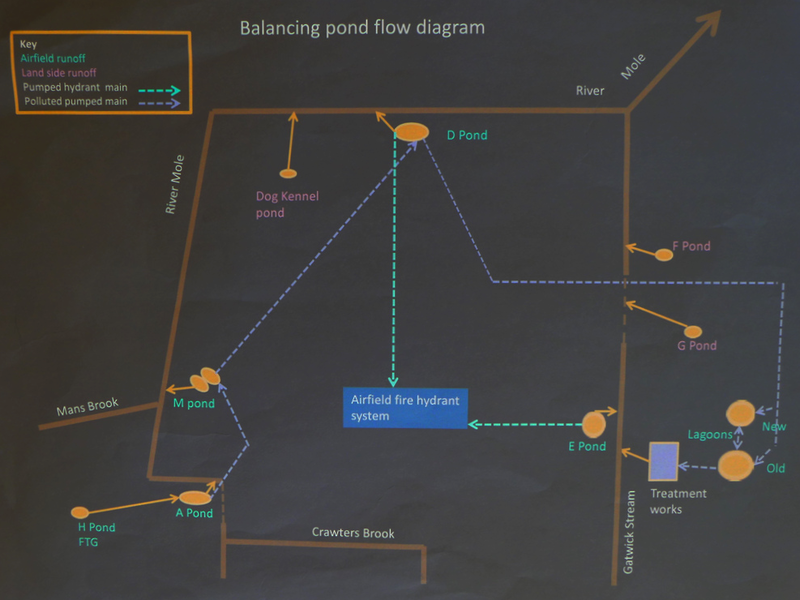 The control system of water management at Gatwick Airport permits regulated discharge of clean water into the River Mole from each of the eight balancing ponds depending on the rate of flow of the river. At times of high flow more water is discharged than in periods of low river flow. Pond D receives the bulk of contaminated and clean water from runway runoff (see below). Water is automatically tested (e.g. measuring biochemical oxygen demand) and contaminated water is separated from clean and is then pumped through a 3.5km pipe to Crawley Sewage treatment works at Tinsley Green where it is held in large Y shaped ponds before treatment and eventual release into the river. Clean water from Pond D is separated, aerated and enters the River Mole directly. However, even in flood conditions, a maximum discharge of separated clean water into the river of just 1680 litres per second (1.6m3/sec 1.6 cumecs) is possible, as each archimedes screw can only lift 860 litres per second and only two are allowed to operate at any one time. The discharge of the River Mole entering the airport boundary during times of flood often exceeds 10 cumecs and can exceed 20 cumecs at Sidlow, near Reigate. The addition of 1.6 cumecs, regulated to slightly precede the natural flood peak, is therefore of little significance to the overall flood conditions of the river. In contrast, at times of low flow some 75% of the river discharge comes from Crawley sewage treatment works which outflows at Tinsley Green. Much of this is treated water from Pond D and homes and industry across the Crawley area. Despite some local myths, there are no “flood gates” at Gatwick airport or manual or automated systems which could allow significantly sudden discharges beyond a maximum of 1.6 cumecs to be discharged at times of high flow into the River Mole and therefore exacerbate flooding downstream of the airport. The only “flood gates”, if they can be called as such, are located at the new Gatwick Stream flood alleviation scheme, operational from 2014, and these are described below and would also never cause a sudden peak discharge beyond the natural storm flow. There is little evidence from hydrographs that there are any spikes or discharge peaks outside the expected normal hydrograph curves for high intensity rainfall events, particularly those associated with the floods during the past very wet winter 2013-2014. A sudden discharge of water of any significance would show up on Environment Agency hydrographs and, monitoring these during the course of the winter, there was no clear evidence of unexpected peaks or surges outside the normal response to rainfall along the river downstream of the airport. The winter 2013-2014 yielded 250% more rainfall than average for the area and the Gatwick holding ponds and water management system remained within the design capacity. On its course through the airport, the River Mole is owned and managed by London Gatwick. The airport has the responsibility to manage the riparian zone (flood plain) and the channel to maintain efficient discharge. River levels and pollution levels are constantly monitored by means of gauges and biochemical oxygen demand. The River Mole enters a culvert built in the 1950’s underneath the west end of the runway. The river was diverted north of the runway in 2000 to allow for the North Terminal. The new channel for the River Mole around the airport is entirely artificial but has been carefully designed as an attractive wooded park-like area with public access being maintained along much of the stretch around Povey Cross bridge for recreational enjoyment, even inside parts of the airport boundary. Gatwick Operational staff walk the entire airport stretch of the Mole twice a year to monitor the state of banks and spot any disruption to the efficient flow of the river along the artificial flood plain. The channel itself has been designed as an efficient shape to discharge flows effectively and an artificial flood plain has been built to safely allow for discharges that exceed bankfull stage (the natural maximum discharge for the channel beyond which floods across the flood plain occur). 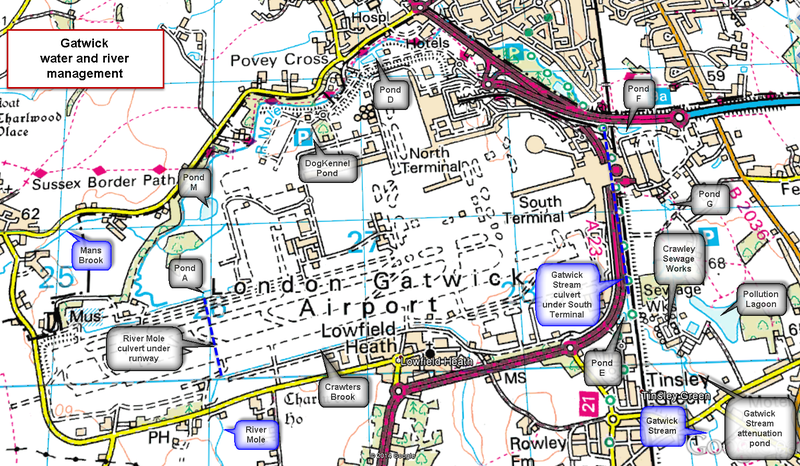 Gatwick Airport, just like other extensively urbanised land uses such towns like Crawley or Horley or industrial estates like Manor Royal business park, cannot be solely capable or responsible for controlling flooding on the River Mole. These land users might endeavour to limit flooding locally to acceptable regulated levels but complete prevention of flooding is not possible. A holistic approach using a variety of hard and soft engineering techniques across the whole drainage basin is likely to be most successful in controlling floods and the embryonic Upper Mole Flood Alleviation Scheme (UMFAS) is just such an example. Nevertheless, even with UMFAS, some flooding along the River Mole will continue to occur across the flood plain, an area which includes the airport, during times of exceptionally high rainfall totals and during high rainfall intensities (the latter becoming particularly more common). These weather events are still “natural” on a river basin scale and, whilst airports can attenuate flow off runways by careful management, they cannot completely prevent floods from occurring that are caused by intense rainfall across an entire drainage basin. Overwhelming discharges will inevitably overwhelm flood plains should they exceed the design capabilities of the engineered defences. Nevertheless, it is still the responsibility of major land users to control floods and reduce impacts to acceptable levels and to protect key infrastructure and this is what Gatwick is doing by investing in modern flood control schemes both within the airport boundaries and across the whole Upper Mole catchment. What follows are some details about Gatwick Airport engineering schemes designed to control water flows in and around the airport. Pond M – is a relatively new balancing pond. Its role is to attenuate airfield runoff and complete initial treatment of contaminated runoff. Especially during wet periods, it transfers a controlled discharge of clean water to the River Mole by allowing outlets in a chamber to overflow clean water into the river after passing through “interceptors” that remove any remaining aviation fuel or silt. Clean water from Pond M is discharged into the River Mole from a controlled overflow shown below. The volume of water discharged into the river at this location is designed to be small even at times of peak rainfall intensity. During rainfall there is discharge at greenfield rates into the River Mole from this balancing pond. Summer runoff from runways is cleaner so more water is discharged into river as there are no anti-icing used. In winter more of the water from Pond M is contaminated and so enters the transfer system to Pond D for further treatment. Prior to entering balancing pond M, runoff from the runway passes through a sensor that continuously measures biochemical oxygen demand (BOD) and detects anti-icing chemicals and other contaminants and diverts contaminated water with BOD >10mg/l to the contaminated holding pond for storage. This is then transferred to Pond D for tertiary treatment such as removal of oil / aviation fuel and silts and thence contaminated water is sent to pollution lagoons for further treatment prior to entering the Crawley Water Treatment processing plant east of the runway near Tinsley Green. There are two aircraft stands where aircraft washing is permitted. These two stands drain to a treatment plant which removes heavy metals released during aircraft washing including cadmium. Within Pond M catchment there are 2 aircraft stands. Pond A – is a balancing pond located at the outflow of the River Mole from its culvert under west end of the runway. Pollution monitoring also takes place here of all water shed from the west end of the runway. After flooding of the runway in 1967 the culvert was found wanting so a “syphon” was added. A syphon is essentially an additional channel which provides more capacity at times of peak flow to reduce the risk of flooding on the runway. Pond D – this is the central “hub” of water control and treatment at Gatwick Airport and sits just behind the North Terminal. Pond D receives all dirty contaminated water from LGW runoff from each of the balancing ponds e.g oil / aviation fuel and anti-icing chemicals. D pond also drains the eastern area of airfield and both terminals. Pond D is sited approximately 50m above sea level and a levelling gauge indicates the height of the water in the pond. During the 23-24 Dec winter flood Pond D was at its highest ever level at around 55m asl and was above the level of the culvert feeding it. A more extreme weather event could cause Pond D to be overwhelmed and over-top, in which case the North Terminal, being lower elevation, could be flooded at ground level. Three massive archimedes screws lift water from Pond D, aerating it at same time, up to separation ponds for clean and contaminated water. Each screw can lift 840 litres per second. Gatwick is permitted only to use two screws at any one time, the third being present in case of mechanical failure of the others. Two screws are therefore said to be “on duty” whilst a third is always on stand-by. During peak storm runoff the two screws are able to lift an absolute maximum of 1680 litres of water per second from pond D to flow through two parallel separators. Biochemical Oxygen demand (BOD) is monitored continuously to check the status of water entering the ponds and separate accordingly into clean or contaminated ponds. Clean water enters a separate pond where it is aerated to reach a required standard before being discharged into the River Mole just downstream of Povey Cross Bridge via a surface spillway built to allow water to flow naturally, under gravity and unimpeded out of the pond once a certain level is reached during flood conditions. There are no gates and there is no impounding of large volumes of water that could then be “released” to cause a sudden flood peak in the Mole downstream. The additional discharge into the River Mole from Gatwick airport from Pond D cannot exceed 1.6 cumecs because the two screws jointly have a maximum capacity of 1.6 cumecs. During “normal” river flow and “average” rainfall conditions there is little or no discharge of clean water into the River Mole. The rate of discharge into the River Mole from Pond D depends on the rate of flow of the river itself. When the River Mole is at high flow conditions more airport water is permitted to be discharged from the clean pond. Rates of discharge are set by the Environment Agency and automatically controlled by automated systems at Pond D.
The contaminated water from Pond D is further cleaned of silt by use of interceptors and any oil or aviation fuel is removed by running absorbent filaments through the surface of the water. This is then extracted by means of mechanical pressure. The process is continuous. The water from this pond is then pumped along a 3.5km pipe to pollution lagoons outside the eastern boundary of the airport and thence finally to the Crawley water treatment works where it joins the water arriving Crawley which is is cleaned to a standard non-injurious to fish prior to being released into the natural water course of the Gatwick Stream which joins the River Mole near the Hookwood roundabout. Gatwick airport contaminated runoff is therefore treated through the Crawley water treatment works and is the same quality. The flow of contaminated Gatwick runoff permitted through Crawley treatment works is 50 litres per second or 0.05 cumecs. The attenuated discharge of runway runoff in the Crawley treatment works represents no significant “additional” runoff other than what would have reached the Gatwick Stream or Mole in natural conditions. With the maximum discharge of clean water at Pond D at 1680 litres per second (1.6 cumecs) and the rate of flow through Crawley treatment plant at 0.05 cumecs, the additional flow to the river network is comparatively small. The Gatwick Stream at flood peak can achieve ten times this flow. A new facility at Pond D also extracts clean water for use in the airport fire hydrant network around the perimeter of the runway, increasing the capacity for the airport to attenuate runoff by recycling water within the airport boundary. All pumping stations relating to water management across LGW have back-up facilities in case of power outage, especially critical during times of flood. Some sources of contamination specific to the airport include fuel spillage, rubber build-up on the runway, cadmium run-off from plane washing and de-icer (ethylene glycol) anti-freeze in winter. The whole system of water management is mostly gravity fed and fully automated. Water quality is checked with 100’s of samples every month. The Environment Agency attaches strict conditions to the quality of water entering the River Mole so that pollution discharges are minimised and that water entering the river is the highest quality possible and not injurious to fish. Fines can be applied if the airport is found to cause pollution along the river, which has happened in the past but it is fortunately a rare event due to tighter controls and monitoring. One incident in the late 1990’s involved a new product being used to de-rubberize the runway, which naturally gets rubber build up from aeroplane tyres. The product being used was based on orange peel but some accidentally got poured down a gutter causing the death of fish downstream in the River Mole. The Environment Agency fined LGW something like £50,000. This kind of incident is fortunately rare because of the sophisticated pollution controls on site and strict monitoring by EA and compliance by LGW of pollution treatment and potential run-off. The culvert running underneath the South Terminal and railway station, built in 1958, unfortunately was not designed with sufficient capacity to accommodate the river discharge during times of extraordinary peak flooding along the Gatwick Stream (i.e. exceeding 15 cumecs). The culvert can accommodate only peak flows during 1:50 year flood events. Larger, less frequent flood events with higher discharges cannot be accommodated by the present culvert. It is not possible to rebuild the culvert due to the extensive airport, road and railway developments that have taken place above it, so a modern attenuation scheme upstream of the culvert has been constructed and is due to be finished in August 2014. The Gatwick Stream scheme is an airport initiative that complements the wider Upper Mole Flood Alleviation Scheme (UMFAS). 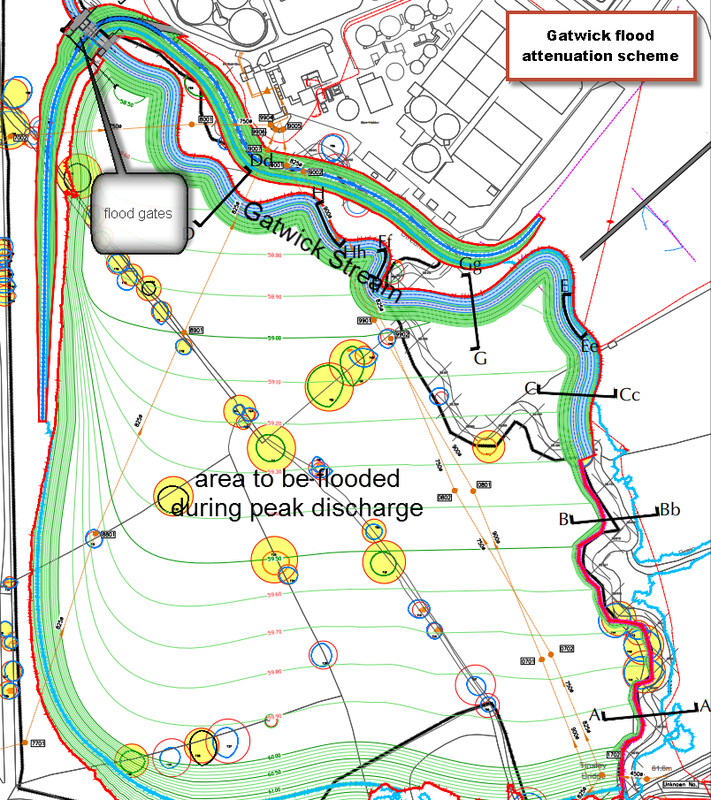 Details for the wider Upper Mole Flood Alleviation Scheme (UMFAS) have been posted here before, find details here. The new Gatwick Stream flood alleviation scheme will be open to the public and appear as a rather unusual park-like layout not dissimilar to “Teletubby Land”! Grassy mounds with numerous oak trees have been retained to conserve local bat populations and increase the park-like appearance of the area. Footpaths will encourage the public to use the area for recreation. Due to the proximity to the end of the runway, large flocks of birds will be discouraged from the site to reduce the risk of birds striking aircraft. This will be achieved by pumping out any water residing in the basin into the stream to maintain a dry environment thus discouraging flocks of wetland bird species, for example. The Gatwick Stream has been diverted and modified into a new meandering natural-looking channel course. Fish have been re-stocked. Flow will be monitored continuously at the South Terminal culvert entrance. If the Gatwick Stream discharge exceeds the 1958 culvert maximum of 15 cumecs then the gates will inch down and attenuate the river flow which will spill over into the newly created basin. Flood waters will fill the basin but will be allowed to discharge naturally as soon as the flood peak has passed. the ONLY flood gates at Gatwick! The park will be open to the public. Interpretative signs will hopefully be in place to explain the scheme and link to the UMFAS and Gatwick flood and water management and wildlife conservation to present flood management in the Upper Mole Basin. This seems to be an excellent opportunity for Gatwick to be on the front foot in terms of displaying a modern flood alleviation scheme put in place on schedule and with public and wildlife conservation interests included. This could be a triumph of modern hydrological engineering made necessary by past mistakes (i.e.1958 culvert being built too small)! It combines modern soft approaches to flood management, such as reintroducing meanders, conserving wildlife and allowing natural wetland environments to attenuate discharge, while also including the hard engineering necessary to protect critical national infrastructure. The scheme should also benefit Horley residents by reducing flood risk downstream. This demonstrates the importance of Gatwick as an international facility requiring protection and the seriousness with which the airport takes its responsibility to control flooding both within the airport and for residents downstream in times of climate change. Airport parking is another large scale land user and comprises further extensive impermeable hard surfaces that could potentially increase surface run-off and create additional flood risk. Deep ditches surround these car parks and these were designed to reduce the need for balancing ponds. The ditches themselves provide self-balancing around each car park. Long term car parks at the North Terminal discharge water from the ditches into a balancing pond known as Dog Kennel Pond and Pond G. Complex control systems handle pond levels and during intense rainfall some car park runoff is discharged into the River Mole near Povey Cross Bridge. The discharge is cleaned using interceptors and so is considered to be a clean flow as it matches the same quality of water that would runoff from any road surface. The final piece of the Gatwick water management jigsaw is a 4km pipeline from Pond D that transfers polluted water to the pollution lagoons clearly visible on maps and Google Earth. These lagoons are netted to prevent harming wildlife. The lagoons further treat by aeration contaminated water prior to transferring it to the Crawley Treatment plant from whence it is discharged into the Gatwick Stream along with waste treatment from Crawley. The final destination for most contaminated airport runoff water is Crawley treatment works which receives airport water from the pollution lagoons nearby which, in turn, received their water from the 4km pipeline from Pond D. The maximum rate of treatment for airport water through the treatment works is 50 litres per second (0.05 cumecs) which, again, is of little significance to the Gatwick Stream at times of high discharge. Gatwick airport is unfortunately sited in an impermeable flood plain vulnerable to flooding. In response, the airport has progressively built a sophisticated hard engineering water management system that collects, separates, cleans and discharges a controlled flow of water back into rivers via complex transfer through a series of balancing ponds and cleaning processes. The system has also had to address past mistakes in engineering that proved wanting in times of more recent intense rainfall events. The majority of contaminated water is discharged into rivers through Crawley Water Treatment works. During periods of heavy or prolonged rainfall some clean water can be discharged from Pond M and Pond D directly into the River Mole. The LGW water management system controls runoff into local streams and this effectively “attenuates” runoff to the equivalent of a grassy greenfield site from each of the eight ponds around the site. Water management and flood control at Gatwick airport is more strictly regulated and more carefully monitored than many expanding urban areas in the same catchment, for example, in Crawley and Horley. These urban areas, creeping inexorably onto flood plains can exacerbate flooding to a greater degree than the airport alone, though this would need more detailed investigation to “prove”. The causes of flooding in the Mole catchment are a combination of factors which were explored in previous posts on this blog found here. Importantly, the management of water flow within Gatwick is sophisticated, automated and ongoing. There are no “flood gates” that can be opened to cause a sudden increase in discharge on the River Mole. Inside the airport, the major flood event on 23-24 Dec 2013 was related to intense rainfall causing rain water to migrate through the maze of 1980’s airport piping, drains and ducting and, unfortunately, discharge through a wall directly into an electrical facility servicing the North Terminal. The complex organic historical growth of the airport has created unique problems of management that require continuous investment and engineering to solve. Finally, the airport has impressive “epic” engineering structures that control, separate, transfer and treat runoff from the runways continuously and discharge an attenuated flow of clean water into the River Mole and contaminated water via the Crawley treatment works. Discharge is usually low but, it is worth remembering that all engineering structures are built to a design limit. New water engineering schemes at Gatwick, such as Pond M, are being designed to protect against rare events of exceptionally high rainfall with return periods of at least 1:120 years. Events yielding rainfall in excess of these design capabilities will still cause flooding both within the airport and downstream. Plans to add another runway should include awareness of flood attenuation both within the airport boundary and for communities downstream. The River Mole could become a “beacon” example of modern holistic river management! It could also become a vital green lung for this part of the South East alongside a major international airport. As the airport hopefully continues to invest responsibly in both soft and hard management along the river course, as much of the river as possible should be made available for recreation and public access. The River Mole VISION should be for a continuous green network of footpaths and attractive open spaces to exist along an ecologically rich riparian zone for local residents to enjoy: an unbroken network of paths from Rusper, through Crawley and Gatwick and onward to Dorking and through the Mole Gap into Leatherhead and Fetcham to Hampton Court! Such a “Mole link” could enhance the natural diversity and varied landscape of the area as well as celebrating the vibrant economy, history and even enhancing local tourism. This vision will require continued work with local authorities, land owners and the public to encourage a wider understanding of the key importance and benefits of our river network to the whole community and create a network of access agreements to join up this linear park. Involvement of the public in how they might wish to use the river, particularly with any impact of a new runway, could be a key to successful management of the River Mole into the future. The Nutfield Marsh nature reserve, a wetland habitat designed, in part, to attenuate flood runoff on Redhill Brook by designing a natural wetland, could be a design blue-print for the Upper Mole. This nature reserve has partly been managed by school groups from Reigate Grammar working with Reigate Area Conservation Volunteers. The nature reserve has a role to play in reducing flood risk downstream on the Redhill Brook. Public access and enjoyment of these interesting locations will be both educational, healthy and yield a greater understanding of the need for careful management of rivers and flood plains as we likely face climate extremes and changing flood risks in the future. The information in this post is based on a lengthy tour and investigation of the water management engineering in Gatwick airport especially designed for RGSweather and kindly hosted by John Barber (LGW Water Quality Manager) and Tom McShane (Project Manager). All sites pertaining to water management around LGW were visited at the end of March 2014. John and Tom imparted expert knowledge and this post represents a collaborative approach to publish, as far as possible, a clear and factually correct outline of flood control in LGW. Comments / further information /updates always welcome. Landlord raised this cottage above 100 year flood risk level: this is a ROAD, not the river! The River Mole is a modest lowland river in SE England that rises near Rusper in the wooded hilly heartland of the Surrey / Sussex Weald, near Crawley and Horsham. The Mole and its tributaries flow broadly north, through Crawley, around and under Gatwick airport, before meandering through mostly rural countryside to Dorking. The Mole Gap at Dorking is one of the defining geomorphological features of the river as it flows through a gap in the North Downs chalk ridge to reach the London Basin where it finally meets the Thames at Hampton Court. The length of the river is approx 80km, excluding tributaries. The Mole has a catchment of 512km 2 and a mean discharge in its middle course at Sidlow of 2.4 cumecs and a mean discharge at its confluence with the Thames at Esher of 6 cumecs (cubic metres per second). The long term flow graphs below show how these mean flows can be dwarfed by occasional discharges exceeding 50 cumecs. The worst flooding in recent years was in Autumn 2000 when a 1:300 year storm caused the Mole to flood 500+ houses, leading to the evacuation of over 200 residents and the closure of the M25. 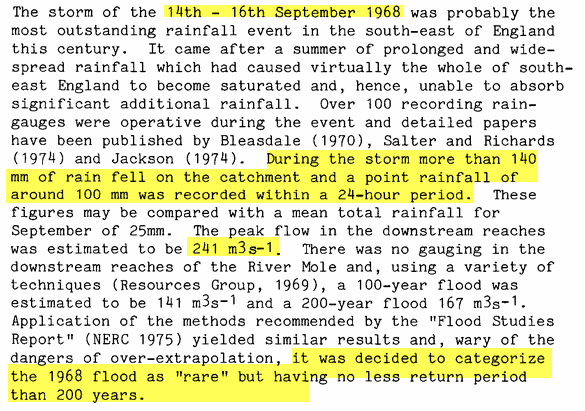 The worst recorded flooding in the River Mole was in 1968 when a rare 1:200 year storm caused rainfall to exceed 100mm in 24 hours and a staggering discharge over 240 cumecs in the Lower Mole (see extract below). For comparison, the average discharge of the River Thames in London is 65 cumecs and the average September rainfall is 25mm. So, the River Mole is usually well behaved but, like most rivers, it has rare moments of significant flooding. Planning, developers and residents should take these rare, but arguably increasingly frequent, extreme events into consideration. Unfortunately, like many SE rivers, the River Mole is largely ignored and out of the public imagination until it behaves “badly”. Flooding is, of course, entirely natural river behaviour. This post outlines the causes of flooding in the River Mole catchment, some of the impacts from the recent December/January 2013 storms (worst in 45 years) and the management schemes designed to reduce the flood risk. It also argues that living with, valuing and understanding our rivers, allowing them to behave naturally and getting residents involved with their restoration is the way forward for managing the River Mole. Gatwick airport: power failure from flooding causing delays with luggage handling (see below for more on airport flood vulnerability) on Christmas Eve; 100 flights delayed or cancelled; thousands of travellers were left stranded or abandoned as rail connections were disrupted as well. Power cuts across the county e.g.100 homes in Merstham and Sidlow left without power for 3 days. UK Power Networks raised compensation from £27 to £75 for customers without power for 48-60 hrs. Burford Bridge hotel, Dorking and Ye Olde Six Bells in Horley : amongst other commercial properties were submerged by flooding and closed for extended periods. A severe flood warning was issued by the Environment Agency for one stretch of the Mole during this period, meaning there was a threat to life. It should not be forgotten that people who have their homes flooded can suffer seriously from stress and a feeling of dislocation from their property which can be permanent. This excludes consideration of the significant financial cost of flooding. The 2012-2016 Surrey Local Flood Risk Management Plan states that “Surrey is a county with a high risk of flooding” and that “we cannot stop flooding in Surrey”. 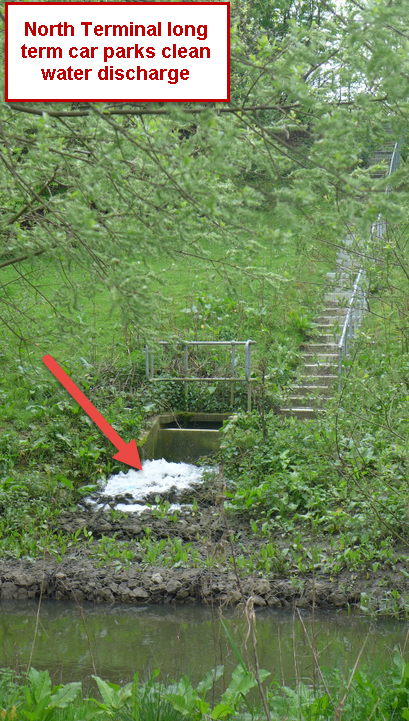 So… why does the Mole occasionally flood so badly and what is being done about it? 1. Fluvial floods: rivers naturally burst their banks and water naturally spills across flood plains when intensive rainfall (acute fluvial flooding) or prolonged periods of rainfall (chronic flood episodes) cause river levels to rise beyond bankfull stage. Rivers respond differently to rainfall events. The River Mole responds rapidly to rainfall and is a “flashy” river. This means that river levels rise quickly after rainfall. River flooding along the Mole is usually across rural and agricultural flood plains. However, urban development around Crawley, Gatwick, Horley, Reigate, Dorking, Leatherhead and Cobham have substantial numbers of properties at risk from river floods associated with the Mole, as have tributaries such as Burstow Brook and Gatwick Stream. 2. Surface water flooding / pluvial flooding: this type of flooding occurs when the drainage or sewer capacity is overwhelmed by the volume of rainfall. This happened in Morrisons car park, Reigate after the heavy rain 23-24 Dec 2013. Some 46,500 properties are at risk from this type of flooding in Surrey during a 1:200 year storm event. Reigate and Redhill are both identified in the list of 5 highest risk areas for surface water flooding in Surrey. 3. Groundwater flooding: Low lying areas, usually in more rural locations with permeable bedrock, are prone to the water table rising in prolonged wet weather causing surface flooding. This can continue to occur long after rainfall has ceased, sometimes flooding roads and railways. It is most common on permeable chalk strata, often where it meets clay geology, along the North Downs. The A25 between Reigate and Dorking is prone to such groundwater flooding as the water table rises on the scarp slope of the Downs and flows across the road, often at the boundary between chalk and gault clay. 4. 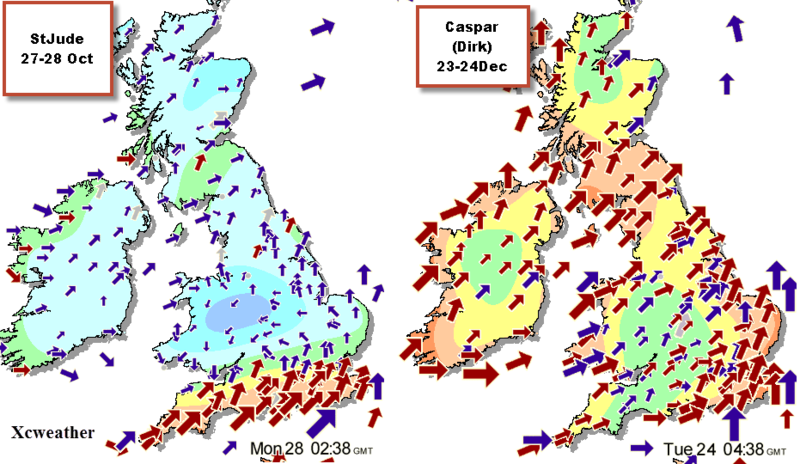 Reservoir / dam breach flooding: The record of UK reservoir safety is excellent but the potential failure of any dam wall, even ones that appear modest in scale, would cause significant acute flash flooding down river valleys. There are 8 dams in Surrey measured as High Risk category that would cause significant floods if they breached e.g. Mytchett Lake embankment. There are several dams in the Mole catchment which are low risk and smaller in scale, for example Tilgate Lake in Crawley. Legislation requires any such dams to be regularly monitored for safety, so the risk of breaching is very low in the Mole Valley, but nevertheless, part of flood risk assessment in this area. There are several factors that make the River Mole more or less prone to flooding. Some are static factors that are relatively fixed, such as rock type. Other factors are more changeable such as human developments and even rainfall intensity and amount. The causes of floods are physical (rainfall, geology, relief etc) but human activities have a great deal of influence on the nature of flooding and the vulnerability of communities to flood hazards. Geology: the solid bedrock of the River Mole drainage basin is predominantly impermeable Wealden Clays and Greensand. More than 60% of the solid geology is “low permeability” which means that rainfall is unable to sink into the rocks and quickly runs-off into streams causing the river to respond rapidly to rainfall events. This rapid response to rainfall is known as “flashy” and makes the Upper Mole rise within just a few hours after rainfall. 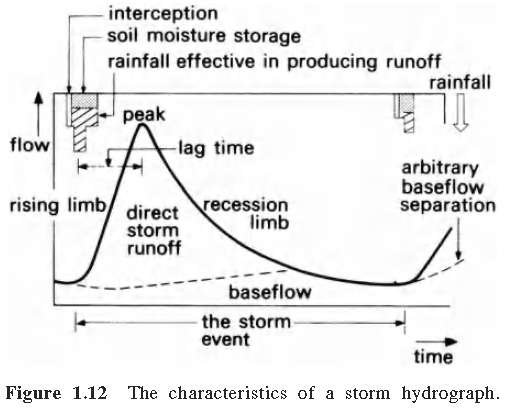 A key measurement on hydrographs is “lag time”: the time between peak rainfall and peak discharge. In the Upper Mole the lag time can be measured in hours. The flood peak then takes some 24 hours to reach the Lower Mole, time to get flood warnings and protection in place. A comparison of the long term Mole hydrograph with the Kennet shows how flashy the River Mole is in comparison with this similarly sized river basin, due partly to it’s geology. Shape of catchment: the shape of the Mole drainage basin is like a teardrop: with the Upper Mole (sources and tributaries) occupying a larger and more circular basin shape which is then “squeezed” through the Mole Gap into a more elongated basin shape in the Lower Mole. A circular lowland river basin can be said to collect more rainfall and deliver it more rapidly to rivers than a more elongated shape (though elongated catchments are common in mountainous regions and these respond rapidly to rainfall due to steep relief). The average distance “raindrops” have to travel to reach a stream is less in a circular catchment, especially one with numerous streams or, in the case of the Mole catchment, a high density of culverts, ditches and drains. This reduced distance encourages a rapid flood response. The result is that the larger area of the Upper Mole catchment south of the Downs ridge, is where much of the input from precipitation is derived. It also means that rainfall, flood protection and urban development in the Upper Mole catchment to a great extent controls discharge and flooding downstream into the Lower Mole, which is where the majority of properties at risk from flooding are located on the Mole flood plain. The secret of flood control in the whole Mole catchment arguably therefore largely lies in managing hydrology and development in the Upper Mole basin. Relief: Whilst the SE is associated with low relief, the Mole catchment has a significant maximum elevation of 265m at Leith Hill, the highest hill in the SE. The North Downs from Ranmore and Box Hill to Reigate Hill are elevated by over 100m above the valleys below. These elevations are sufficient to cause some local enhancement of precipitation through orographic uplift. Local rainfall levels can vary considerably as measured by weather stations found here. Precipitation: The annual average rainfall for the River Mole is comparatively modest at around 700-800mm/pa. Excluding evapotranspiration, much of this precipitation will, eventually, find it’s way into the river due to the impermeable geology (discounting a proportion of abstracted groundwater that might be removed from the river basin). The rainfall during the 24 hours 23-24 Dec was the wettest for 35 years, yielding over 71mm in parts of the Mole catchment. Each millimetre of rainfall equals 1litre of rainfall per square metre. In this rainfall event an average of approx 50mm of rainfall fell over the catchment in 24 hours, locally some places experienced 70mm in 24 hours, which is a high rainfall intensity. This would be equivalent to some 260 million buckets of water falling onto the River Mole drainage basin! Extremely intense rainfall events cause water to flow overland into rivers very rapidly, especially if the ground is saturated. Such rainfall events are likely to increase with climate change and our sheltered area of Surrey is not immune from these. Effluent discharge: a growing urban population produces more effluent discharge which is treated in numerous water treatment plants and then passed into the River Mole. There is some additional input of effluent from other catchments which has added to the discharge of the River Mole. Interestingly, Gatwick airport uses about 1 million m3 of water every year (dcreasing with efficiencies made) and this water, presumably makes its way into the river as treated discharge during the course of the year. The source of water for LGW is not known. Urban growth: the growth of towns like Crawley, Horsham and Horley and the expansion of Gatwick airport terminals has increased surface runoff by expanding impermeable surfaces that allows precipitation to transfer to the river more rapidly. The removal of vegetation / deforestation during development also reduces interception storage and reduces the amount of water abstracted naturally by trees. The effect of urbanisation is to enhance the already naturally flashy nature of the River Mole due to impermeable geology and make it more prone to flooding. Gatwick airport, Manor Royal and Crawley located in the upper reaches of the River Mole catchment have had an impact on flooding downstream by encouraging the runoff of water into concrete lined channels and culverts designed to remove water efficiently. This has the effect of transferring flood peaks downstream more quickly and thus potentially increasing the steep rising limb of hydrographs and flood peaks further downstream. LGW has an obligation and an ongoing policy “to incorporate flood risk management in all new developments and to avoid inappropriate development in areas of flood risk “(2011 water quality flood management action plan). This would include any development of a second runway which would, incidentally, involve the placing of the River Mole in a longer tunnel. Changing land use: Land use goes beyond the distinction of simply urban or rural. In common with other SE catchments, the Mole basin has expanding land uses such as golf courses, industrial parks like Manor Royal and numerous airport car parks. These land uses encourage rapid runoff into culverts and concrete lined channels decreasing the lag time of rainfall into streams. These channels transfer water to the lower Mole more quickly and can have the effect of raising flood peaks downstream. Saturated ground: though not strictly a “cause” beyond that of precipitation, previously saturated or frozen ground or snowmelt can greatly exacerbate later precipitation episodes to respond more rapidly, flowing overland directly into drains, streams and rivers, and therefore cause more rapid increase in levels on the Mole than would normally be expected. 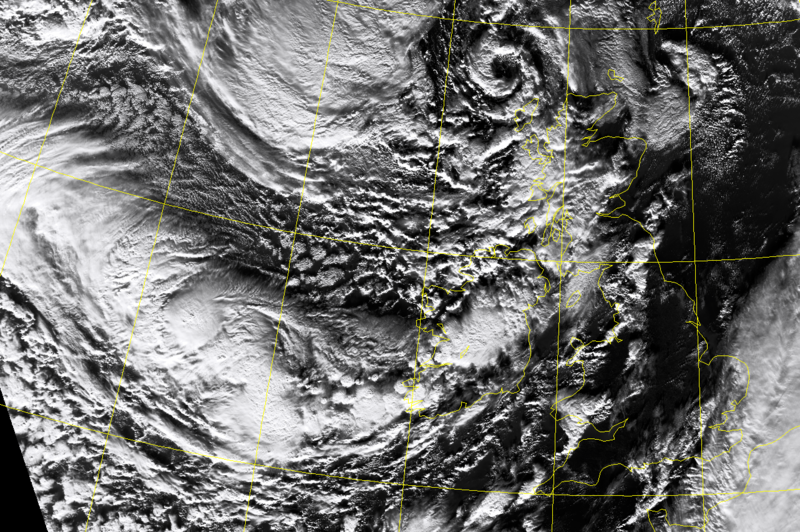 This was experienced in relatively modest rain events on already saturated ground on 17-18 Jan 2013. Modest rainfall totals across the catchment of 4-10mm characterised the Wednesday and Thursday leading up to the heavier rainfall on Fri17 – Sat18 Jan that totalled 30-40mm in some locations. The River Mole levels responded unusually rapidly to this rain because the ground was saturated and unable to infiltrate the additional rainfall, rendering more surfaces impermeable. 72 hour rainfall totals measured at Charlwood for this period amounted to 59mm but this is comparatively modest compared to the 70mm in <12 hours overnight that caused the biggest floods back in 23-24 Dec. Nevertheless, it is the response of the Mole that was rapid: just 10 hours from peak rainfall to peak discharge at Horley. Put this another way: raindrops falling during that storm anywhere in the catchment over Rusper, Horsham, Crawley, Gatiwkc and Horley took about 10 hours to hit the ground, run into the river and thence flow to the gauging station at Horley where levels rose to an all-time record high on the Environment Agency website (pictured). This episode of flooding was short lived, causing evening traffic chaos on the Friday as bridges closed and surface flooding slowed commuters. Rainfalls similar to that of 23-24 Dec would have been a lot more serious on this occasion due to saturation. The River Mole catchment is not, at first glance, heavily protected from floods. Nevertheless, Environment Agency Flood Alerts and Warnings cover most stretches of the river and there are examples of almost every type of flood management in this modest drainage basin. 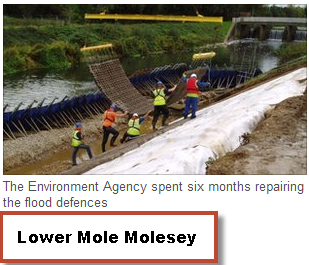 Hard flood engineering defences: The Upper Mole Flood Alleviation Scheme is a £15 million Environment Agency project designed to reduce flooding along the River Mole, in particular in urban areas in the upper reaches prone to flooding such as Crawley, Horley and Gatwick airport. Various schemes are being built to attenuate / delay the flood peak in the upper reaches including upgrading of the flood retention reservoir at Clay Lake and the construction of a higher dam wall at Tilgate Lake (concrete wall construction completed now at Tilagte: with an additional 2.5 metres of dam wall to cope with a 1:1000 year flood). The Worth Farm flood retention pond on the side of the M23 on the outskirts of Crawley is also designed to delay flood peaks entering the town by filling up a detention reservoir. Compared to other airports in the UK, Gatwick is at risk from relatively frequent 1:50 year flood events. This is because it has been built in a low lying area in the flood plain of three streams: Crawters Brook, River Mole and Gatwick Stream. 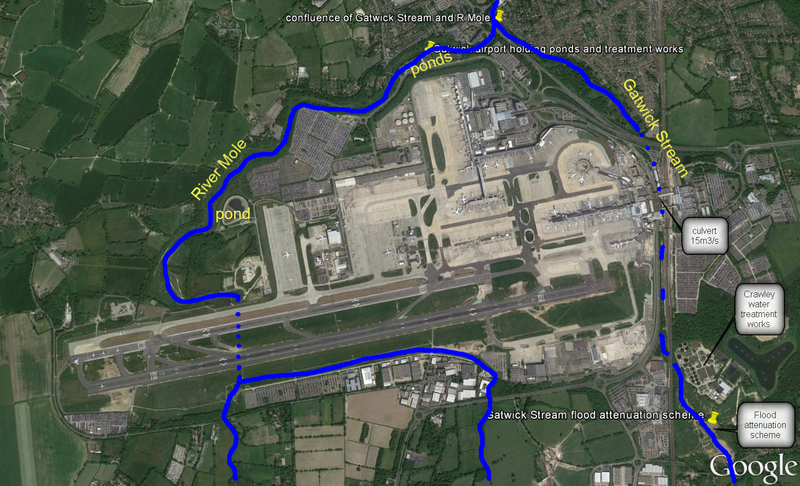 There is almost no extensive modern flood protection in place for LGW, yet. 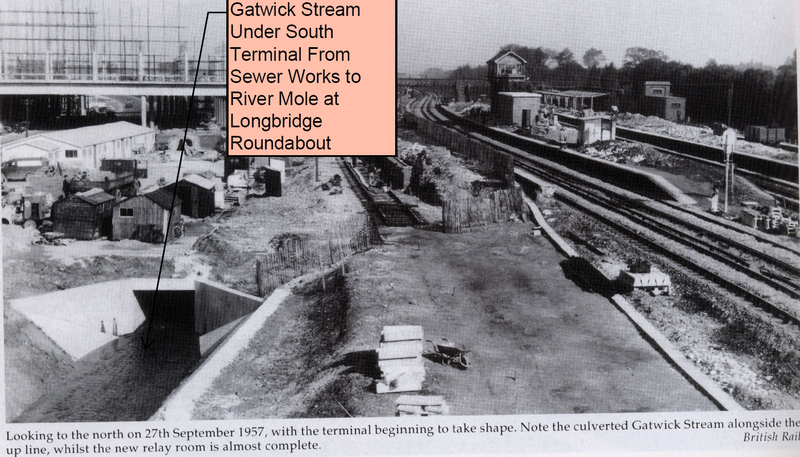 Gatwick Stream was culverted in a large drain underneath the South Terminal during construction in 1957. The River Mole was similarly placed in a big pipe under the runway. On EA flood risk maps (below) parts of both North and South Terminals are shown to be at risk from medium and high annual flood risk (>1% chance of annual flooding). Compared with other major airports, Gatwick has been built in a relatively soggy flood plain! Numerous flood ponds (balancing ponds) around the perimeter of the taxi and runways are designed to attenuate the flow of water off the hard surfaces so that flood peaks downstream of Gatwick are delayed and reduced to acceptable levels in high rainfall events. The water in the ponds is sometimes contaminated with pollutants (such a cadmium, used in plane de-icing, and aviation fuel) and must therefore be treated to a required level that is “not injurious to fish” before disharge is permitted into the Mole river itself. However, these ponds do not prevent LGW itself from floods from “upstream” sources. During the Dec23-24 flooding the luggage system failed due to power cuts caused by flooding of the Gatwick Stream and thousands of passengers were stranded by more than 100 cancelled or delayed flights. The airport remains vulnerable to 1:50 year flood events when compared to the 1:1000* year level of protection afforded by river flood defenses for London from the Thames Barrier, for example. 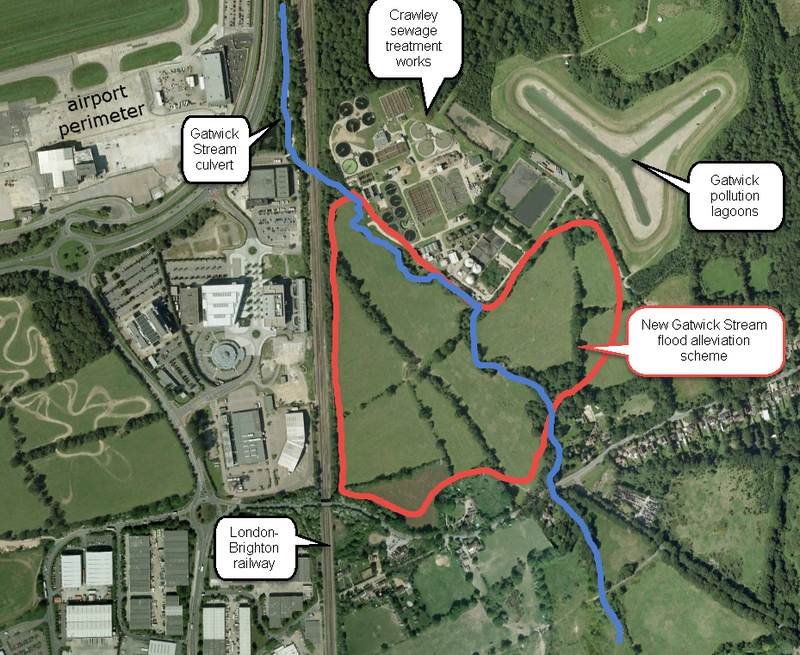 So Gatwick is investing in an £8 million Gatwick Stream Flood Attenuation Scheme and working closely with the Environment Agency to reduce flood risk. This latest scheme is a detention pond with iron flood gates built between Manor Royal and the A23. The pond is designed to store over 180,000 cumecs of water from the Gatwick Stream at high flow periods. During normal flow the pond will be empty and the trees and habitats and footpaths built into the design will encourage both human and wildlife visitors on completion. The project is designed to “double the level of flood protection” for Gatwick Airport from 1:50 year flood risk to defences able to protect against a 1:100 year flood risk event. It is under way. Gatwick is also investing £4million as a contribution to the Upper Mole Flood Alleviation scheme mentioned previously. LGW is therefore taking serious steps to protect the catchment from flooding and, from ongoing policy documents it is clear that LGW are endeavouring to be good neighbours with the local community, stating clearly that they will incorporate flood risk management in all new developments and avoid inappropriate development in areas of flood risk (PPS25; water quality management plan 2011). LGW is also involved with sustainable ongoing flood management through groups such as Gatwick Greenspace, for example. The Lower Mole Flood Alleviation Scheme (FAS) extends from Hersham through Esher and Molesey to the confluence with the River Thames near Hampton Court. Operation of the FAS has no adverse impact on flood levels through Leatherhead and Fetcham. The Lower Mole FAS starts approximately 10 kilometres downstream of Leatherhead, and between Leatherhead and the FAS the Mole follows a series of meanders under the M25 and past Cobham. Over the course of this length, the bed level of the River Mole drops by over 20 metres. The Lower Mole FAS is predominantly comprised of a man-made diversion channel, along the course of the old river Ember, which has capacity to convey large flood flows through Molesey without causing property flooding. Along the course of the diversion channel are a series of tilting and radial gates, which are in place to regulate water levels during times of normal river flow. These gates are lowered during times of flooding to allow flow to pass safely along the diversion channel without causing river levels to rise upstream in areas of South Hersham, where raised walls and banks provide protection to local properties. Development of the FAS was instigated after significant flooding in Esher and Molesey in 1968. During the recent flood event, when flows in many parts of the Mole catchment were comparable to those seen in 1968, the FAS was operated in accordance with established procedures and was able to pass the flows through Esher and Molesey, preventing flooding to many thousands of properties in these areas. The operation of the scheme is based on water levels upstream of the main gates and there are no circumstances where any decision would have been taken to operate the scheme at the expense of other communities further afield. Upstream of the first sluice, the River Mole occupies a wide floodplain, with raised banks and defences completing the FAS at the very edges of the floodplain. This means that changes in flow through the FAS result in only minor changes in level across this large area upstream during a flood. The 20 metre drop in elevation along the River Mole between Leatherhead and the FAS, occurring over a distance of 10 kilometres, means that it is not possible for minor variations in water level in the location of the scheme, to influence flood levels in Leatherhead and Fetcham. Flooding in these locations was an unfortunate result of the unprecedented flow in the River Mole, which, as your website posting points out, was comparable only to the flooding in 1968. Since the Lower Mole FAS has been operating successfully for many years and pre-dates many of the newer schemes you have researched in your posting, we do not currently have information available on it on our website. Given the interest in the scheme over the course of the recent flood event, this is something that we shall consider, should resources allow it, in the future. Later in February, subject to weather conditions, we plan on operating structures to temporarily lower levels through the length of the Lower Model FAS. Lowering the ‘normal’ water levels temporarily will allow us to inspect all elements of the FAS following its operation during the recent flood events. We will use the information obtained during this inspection to plan and prioritise our maintenance works, to ensure the FAS continues in future to provide the high level of flood protection it provided to local communities over recent weeks. We are developing a project for potential flood risk management options along the Middle River Mole, taking into consideration many of those local areas flooded this winter. As these plans develop, there will be opportunity for the public to contribute to their development through formal and informal consultation. We would encourage you to get involved as these opportunities arise. Sustainable approaches to flood management: hard engineering is expensive and **arguably creates more problems downstream** and is expensive to maintain. More sustainable modern approaches to flood management involve restoring natural wetland areas to absorb flood peaks naturally in habitat and wildlife rich ecosystems along the course of rivers. Such sustainable approaches to flood management exist in the Upper Mole catchment and include Grattons Park in Crawley and the Moors Project in Redhill / Nutfield Marshes. Although different in character the schemes share the common purpose of putting in place more natural, meandering water courses with vegetated banks and wetlands and flood plains which can be occupied during times of flood. This delays the surge of water downstream and therefore reduces the risk of more damaging floods in urban areas. The Moors Project is managed by Surrey Wildlife Trust with regular key conservation work by Reigate Area Conservation Volunteers and Reigate Grammar School students. The Mole Gap, near Westhumble, has also had some restorative work reinstating an old meander, though this has since silted up. There are numerous other possibilities along the river to restore more wetland habitats, reinstate lost meanders, increase natural sinuosity, naturalize banks and recreate water meadows along the length of the Mole flood plain. **though note that flooding on RMole at Leatherhead and Fetcham 2013-2014 was not caused by any of the Lower Mole Flood Alleviation Schemes (FAS) at Molesey or downstream to Cobham or Esher. The fall of the river between Leatherhead and the FAS at Molesey is over 20 metres in 10km and this gradient makes it impossible for any impact of flood management downstream to “back-up” to the Mole reach at Leatherhead and cause any flooding there. Flood warnings and alerts: Warning and educating the public is a key to successful flood management. The Environment Agency have identified areas at risk from all 4 types of flooding in the Mole catchment. Local Authorities have detailed plans in place to deal with floods of different scales. EA flood zones can be viewed on detailed maps here. The EA also issue warnings and alerts. Finally, councils and planners have adopted the policy of keeping development off the flood plain along the entire length of the River Mole. In conclusion, the River Mole can cause significant impacts from flooding on a local scale and these are likely to get worse with predicted climate change and urban development and population growth in the area. There is also key infrastructure across the catchment which can be impacted severely by relatively high frequency flooding of 1:50 year probability, such as Gatwick airport and rail routes like the Gatwick Express. New “hard” engineering schemes being built in the catchment, such as at M23 Worth Farm and the Gatwick Stream flood attenuation project which address some of the increased flood risk and double protection to defend against 1:100 year flood events. However, the future, in the view of this writer, is to adopt a more holistic approach to managing the River Mole catchment which involves all stake holders and local residents. This might include greater use of sustainable urban designs and approaches to flood management that use the restoration of wetlands and ecologically sensitive management of the whole catchment including careful woodland management, like coppicing, and the restoration of naturally meandering river courses to absorb any increased runoff. A continued policy to restrict development on flood plains is also essential. The resultant areas of beautiful open space, rich with interesting wildlife and diverse habitats can then be open to the public for recreation and exercise during dry periods. A continuous footpath along the entire length of the River Mole from source to “mouth” could be an achievable target with which to measure the progress of such a holistic approach. 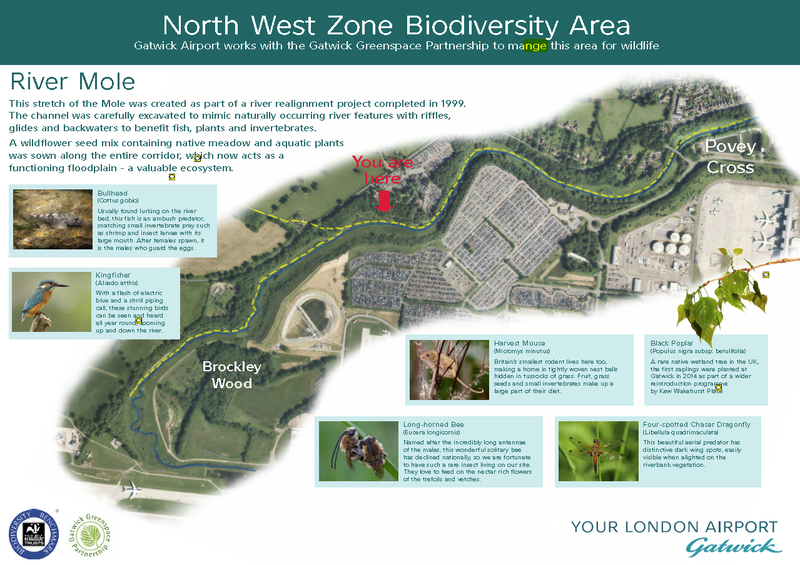 Update: 20/10/2015: Gatwick Greenspace and Gatwick airport manage the river through the NW corner of the airport. This interpretative signage is being designed to go into the stretch of artificial channel. This shows how partnerships such as this can benefit rivers and communities alike. note: this post is for educational purposes; all figures and data are posted in good faith. Feedback and updates welcome to keep things as accurate as possible! News! This post formed the basis of an interview that contributed to a programme on River Mole flooding for Radio4 File on Four to be broadcast in February 2014. Quick interim storm summary graph with data from our Reigate weather station. Analysis and links to follow. Below is a medley of images… analysis to be continued after festive season! Meanwhile… hope you survived unscathed and Happy Christmas! 70mm total rainfall (manual rain gauge reading) now confirmed for Reigate during the storm 24hrs. River Mole 3.45m above normal level: severe EA flood alert issued: the only one in the UK at the time.